Things have been a little busy for me due to being in semester 3 (of 4) of my graduate-level education. I am aware that I am neglecting my blog and I am sorry about that. I’m surprised that I have as many readers as I do 🙂 and its telling me that this blog is of use to more people than I was expecting. I want you to know that I have not forgotten about you. I have thought about how I have wanted to run this blog and recently, I have decided to go in a new direction. I have decided that I want this website to operate on two levels: Facebook and WordPress. The chart below explains how this would work. 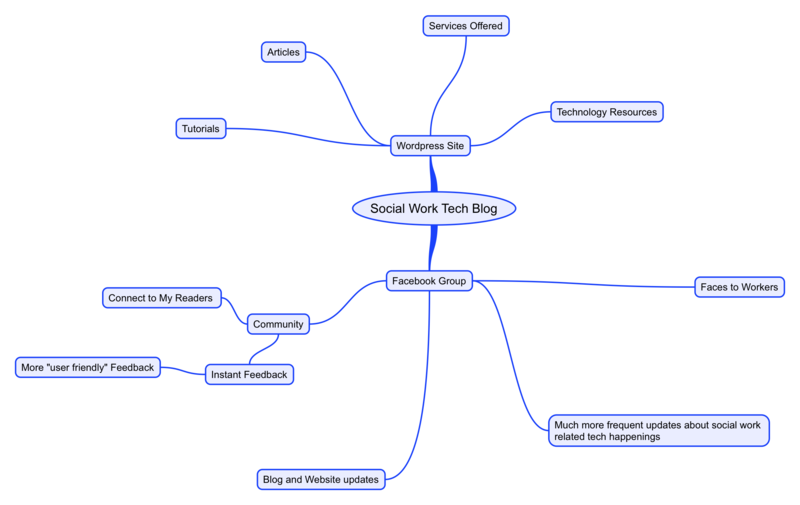 I am keeping this domain as it is, meaning that socialworktechblog.com isn’t going anywhere! I will continue to give you tutorials, articles, and outline any new tech things that I am using in my social work practice. Running a blog is harder than it looks because I want to make sure that everything comes out in an engaging, informative, and visual way. I would like for you to feel welcomed in my home[page] and not feel awkward and out of place, therefore, I put a little bit more effort to relate to those who have limited understanding of technology without boring those who are used to it. I have added a page to this website (which you can see if you are reading this on the site) called “Services Offered“. For locals (near Monterey, CA), I am offering to create your online identity, develop your psychoeducational tools, and provide one-on-one tutoring for those interested in learning about technology. Please check it out. Thanks to receiving my Square Reader, I can now accept credit cards from clients (social work professionals) who procure my services. [The Square Reader will probably be a future update to this blog]. This is a forthcoming page to this site, but my vision is to provide links to readers of this blog to an aesthetically presented layout of resources for psycho-education, including links to PDF files and YouTube videos. Social Work Tech Blog’s online presence is going to be emphasized on Facebook for a variety of reasons. While I have a burgeoning Twitter following, I would like to be able to connect with the social workers that access and use this blog. I envision more participation from those who see Social Work Tech Blog in their Facebook stream when asking for feedback and publishing short posts. I can put up short (trivial) posts on Facebook that I probably would not want on the website. I don’t want quality posts on the website to be drowned out by trivial posts. Even if you don’t subscribe to the RSS feed, I will keep people subscribed to the Facebook page updated and informed about website updates and changes coming up.